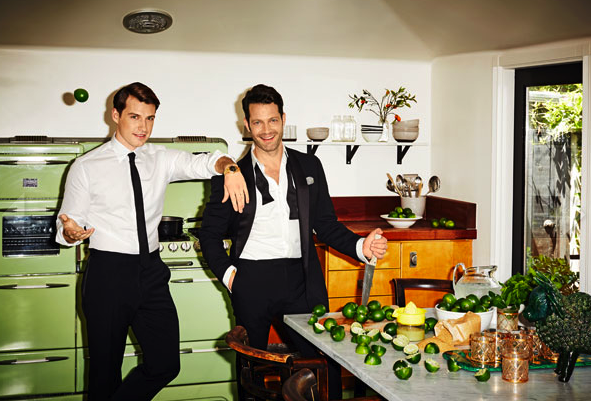 If you've followed La Dolce Vita for a while, then you probably know that it is no secret that I love Nate Berkus' style. He has an innate ability to create warm, chic spaces that are layered with beautiful textures and are infused with personal touches. Nate recently got engaged to fellow interior designer Jeremiah Brent. 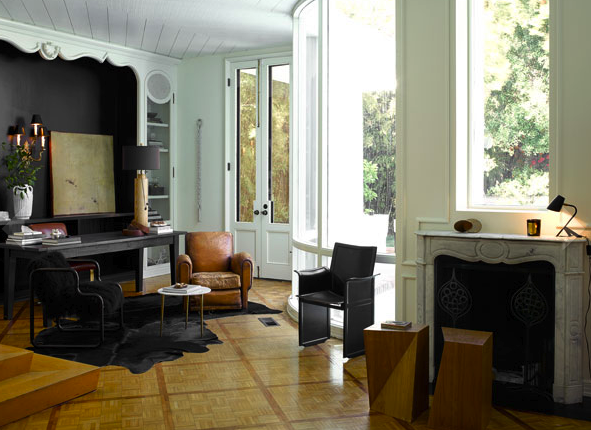 Do you remember when he designed Rachel Zoe's house on the Rachel Zoe Project? Nate and Jeremiah are both so handsome and make such an adorable couple. It's no surprise that this stylish duo's first home together is as beautiful at it is. 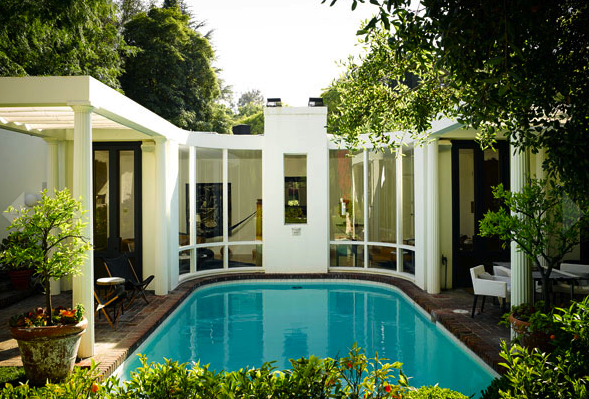 Located in the Hollywood Hills and featured in the August issue of Harper's Bazaar, the home was designed by John Elgin Woolf in 1939. Nate and Jeremiah were drawn to the two bedroom, Regency-style gem for its architectural provenance as they'd long admired the work of Woolf, who counted Katharine Hepburn and Cary Grant among his many celebrity clients. I definitely see both Nate's and Jeremiah's aesthetics reflected in this house. Nate says "I see our styles are now becoming one, which is really exciting to see. We fight about pizza, not about picking out lamps." I love that! I hope to see a lot more of this dashing duo! 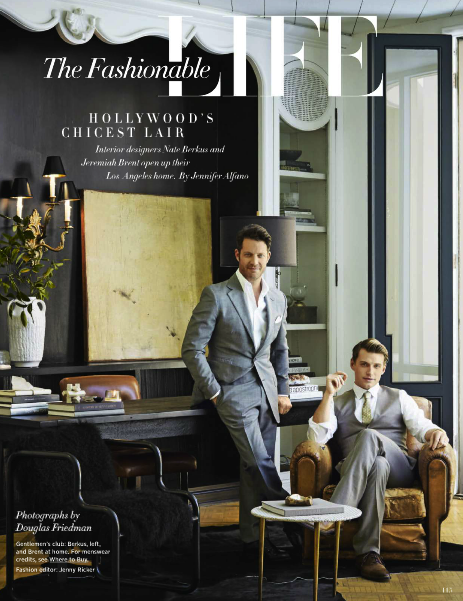 For more of Nate and Jeremiah's new house in the Hollywood Hills, check out the August issue of Harper's Bazaar. It is nice to see how over the years Berkus' work has grow and evolved, becoming more and more sophisticated and refined. They are adorable. I wish they were my neighbors. Could two men be more beautiful! Wish he was my brother inlaw!!!!! I love Nate and think most every one of his projects is amazing. That said, I'm just not feeling this space even though I really want to. To me it seems a bit contrived and doesn't have the wow factor I've come to expect from his work. I know I'm in the minority but that's what makes design art :). Thanks for sharing!!! They are such a hot couple! I got to meet Jeremiah Brent at an event and he was really genuine and low key, as you'd expect. They both have amazing style -- what a duo! That's just not fair! So much beauty in one house... and I don't just mean the interiors. Such a handsome couple! Great highly personal style! Love the home! Great post! Simply gorgeous...both the home and the couple.